Horowitz's piano is "on tour." Is this normal? So...my piano preludes are being performed on Horowitz's piano out here in NorCal next weekend at a recital. Pretty cool! However...is this strange!? I mean...it seems pretty strange to me...unless it's the Greatest Sounding Piano of All Time or something like that. Does this happen to other instruments? Maybe it's better than just sitting in a museum? I first heard of Horowitz's piano being "on tour" years ago. The only other modern piano to achieve celebrity (if that's the right word) is Glenn Gould's. 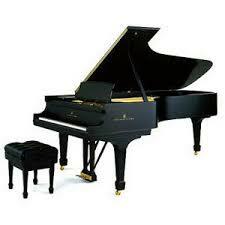 Both were set up in a special way to suit the pianist and were reserved for him. I'm sure Lance can tell about that much better than I can. Perhaps the Horowitz piano that went on tour isn't the one with which he produced his unique sound during the '50s. I remember reading that the felts were filed down and possibly also lacquered to produce that brilliance which wasn't so often evident in his later recordings. Also that the action was very light. Lance? That was very dangerous, Teresa. That piano is known to turn pianists into flat-fingered players. I, too, played Horowitz's piano when it was on tour several years ago in Atlanta, GA. I didn't think it had the same brilliance ... in other words, they took off his "steel-sounding" hammers and used conventional but still well-voiced hammers. The thrill, of course, is to lay your hands on the same keyboard unless the action was also replaced. Only those involved in the maintenance would know this for sure. Our CMG member, Susan Hammond of Classical Kids CDs, just played a recital or two on it in San Francisco. I would imagine the psychological, almost intimidating feeling, about playing such a piano. As John Francis mentioned, the only other Steinway concert grand to enjoy this celebrity was Glenn Gould's, after which he switched to Yamaha late in his career and made his second commercial recording of the Goldbergs for Sony. I personally prefer his earlier mono recording on the Steinway. Another piano of almost equal distinction is Liberace's glittery Baldwin concert grand piano. How I do miss some of these wonderful Baldwin pianos these days. Of course, Glenn Gould's small American Chickering also has some pianistic status. How he loved that piano! I believe Richter sometimes played a Baldwin, didn't he? His first American tour, at least the New York/Boston part of it, used a Hamburg Steinway (as I heard at the time), but a biography of him says he later used a Baldwin. Not that it was so important to him. He always said that a pianist should just use the house piano and be done with it, and he did that in his Siberian tour. Lance wrote: As John Francis mentioned, the only other Steinway concert grand to enjoy this celebrity was Glenn Gould's, after which he switched to Yamaha late in his career and made his second commercial recording of the Goldbergs for Sony. Sounds like he must have been getting paid under the table by the Japanese government. As for Baldwins, we must have covered this before, but wasn't Baldwin the official piano for the NY Philharmonic for many years and therefore also of Leonard Bernstein? I'm sure someone will quickly correct any part of that I've gotten wrong. A number of top pianists switched to Yamaha at about that time, including Andre Watts. He said it was because Steinway's service wasn't what he wanted it to be, and Yamaha's was. I don't know why Gould changed pianos. Indeed, the BALDWIN was the official piano of the New York Philharmonic for many years though most of the performing artists used Steinway instruments for their live concerts. Leonard Bernstein was a Baldwin artist as was Ruth Slenczynska, Benno Moiseiwitsch (in the USA), Godowsky (I believe), Jorge Bolet (highly visible with Baldwin), Earl Wild, Igor Stravinsky, Luciano Pavarotti, Walter Gieseking (in the USA), Joseph Banowetz, Ruth Laredo, David Bar-Illan, Marian McPartland, Liberace, and the list goes on and on. I've recently read Gieseking's little memoir, and it was he (not Richter) who praised Baldwin pianos highly. This was before World War II. After the war, his planned American tour was prevented by protests of the kind that blocked Furtwängler too, which led to him being effectively under house arrest in his Manhattan hotel with a couple of FBI "minders" until he returned to Europe without having played a note here. What instrument he used for his well-known postwar EMI recordings made in London and Geneva I don't remember reading; was it still a Baldwin or could it have been a Bechstein? At any rate, it never became a fetish object like Horowitz's and Gould's Steinways, and he may not have had a particular favorite anyway. John F wrote: I've recently read Gieseking's little memoir, and it was he (not Richter) who praised Baldwin pianos highly. This was before World War II. After the war, his planned American tour was prevented by protests of the kind that blocked Furtwängler too, which led to him being effectively under house arrest in his Manhattan hotel with a couple of FBI "minders" until he returned to Europe without having played a note here. What instrument he used for his well-known postwar EMI recordings made in London and Geneva I don't remember reading; was it still a Baldwin or could it have been a Bechstein? At any rate, it never became a fetish object like Horowitz's and Gould's Steinways, and he may not have had a particular favorite anyway. Somewhat shockingly, many of the technicians who have worked on Horowitz's piano have signed it underneath. Not sure how I feel about that! ...but I do know how I feel about getting to play it! IcedNote wrote: Somewhat shockingly, many of the technicians who have worked on Horowitz's piano have signed it underneath. Not sure how I feel about that! Darn! They cut it off just above where you can see "Lance G. Hill." IcedNote wrote: ...but I do know how I feel about getting to play it!